Nyogbare Primary School, in the Talensi-Nabdam district of Upper East Region, is linked to Southfields Primary School in inner-city Coventry. Nyogbare is in a remote area where most families live by subsistence farming. 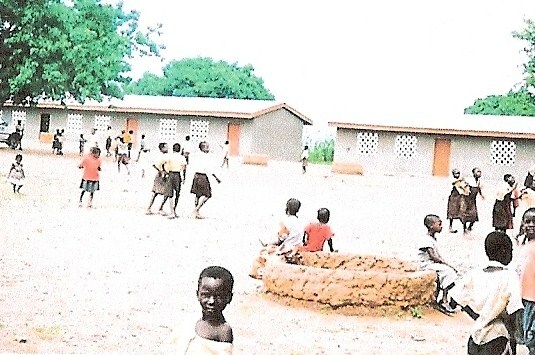 In 2004 the school received a grant from Ghana School Aid for the materials for a 2-room teacher accommodation block. The labour was provided by the local community. The aim was to attract more teachers and help with teacher attendance and punctuality. When the GSA cheque arrived, the school community came out in force to receive it. The Head Teacher, SMC Chairman, PTA Treasurer and Chief all gave a speech thanking Ghana School Aid for its support. The picture shows the school compound. This entry was posted in Projects and tagged nyogbare-primary-school by Penny Sewell. Bookmark the permalink.